Apologies for the delay in updating the fundraising total so far. Slight issue around a forgotten security code – brain like a sieve and all that. (Well, brain pulverised by relentless happenings but let’s keep this blog one of cheer and positivity…) We have a total now. Sonya Barnett who encouraged, collected and managed a range of orders from the staff at the school she teaches. My work colleagues, led by Trisha Carver, who have given up their lunchtimes to create spectacular Christmas table decorations. Effort that makes me cry (good) tears. We received the cheque for LB’s book cover (Approaching Disability: Current Issues and Critical Perspectives by Rebecca Mallett and Katherine Runswick-Cole, coming out next year). What a remarkable achievement. And what a brilliant contribution to the fund. The dude rocked, and continues to do so. And more remote efforts via social media. The demonstration of the reach, flexibility and power of which (heartwarming to a complete geek) has been a positive dimension to this whole experience. 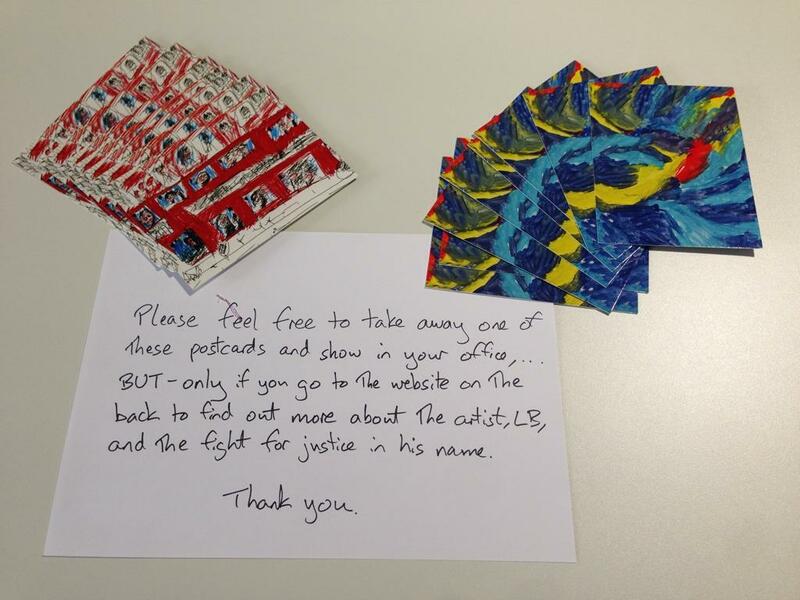 George Julian invited people to request a personalised postcard from her to free up space to buy some of LB’s cards. Bringing back memories of those old Royal Mail ads around the importance of receiving a personal letter/card in the post. These efforts are so important to us, not least because they signal a collective demonstration that what happened to LB is completely unacceptable. That change is needed. That things cannot be. So, an enormous thank you. 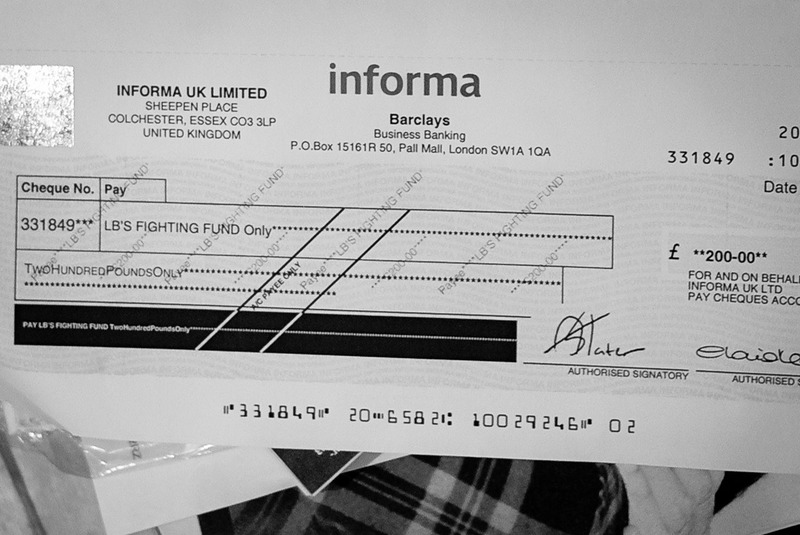 And the total at 26 November is: £4096.34. Four thousand and ninety six pounds and thirty four pence. Bloody amazing. Well fundraising has taken on a life of its own in many ways. LB’s cards, postcards and prints are filling postbags around the country (and further). People are tweeting photos of their cards/prints, blogging this fundraising link and chipping in with offers of help/fundraising suggestions. The warmth, collective rage and upset about what’s happened and the stories attached to some of the emails, are both heartwarming and heartbreaking. On Saturday we had a stall at LB’s school Christmas craft fair. Selling, in addition to LB’s artwork, some donated beautiful Jangneus ‘seconds’ and pictures by LB’s grandad. It was lovely to see pupils and staff. (Sob). And to hear more stories about the dude who never stops delivering. Clea came along with her mum. LB was in the first class Clea taught at school (she maintains this class is the reason she’s stayed at the school all these years). Clea’s mum recalled turning up to help in the classroom one day. LB turned to her and announced; “My dog told me I’d be hanging out with old people at school today”. Hilarious. That he said it. That she remembers it. And that we’re laughing about it. So many years later.